This page has links to podcasts, articles, video clips and other media about making the arts more accessible. When Bruce Gladwin became Artistic Director of Back to Back Theatre in 1999, he asked the ensemble of six actors what they wanted to do. “We want to tour the world,” they told him. And that’s what they’ve been doing. Driven by actors perceived to have intellectual disabilities, the company’s award-winning shows have toured to more than 70 cities in 20 countries. Its 2005 outdoor work, Small Metal Objects, will feature in the New Zealand Festival 2016, opening in Wellington on 26 February. Listen to Bruce Gladwin talk to Kim Hill on Radio New Zealand. Sarah Houbolt performed her one-woman show at TAPAC in Auckland in November 2015. 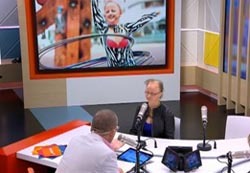 She promoted her show, KooKoo the Birdgirl, in an interview on TV3's Paul Henry Week Days. "It's an amazing story of triumph ... I want to honour a legacy of performers on the fringe." Asked about being partially sighted and being different, Sarah responded: “Growing up, I was treated pretty much the same because I’m a human, like everyone else. But there were definitely moments where I knew I looked a bit different, especially as a teenager. It was a real identity phase ... I wanted to channel those ideas of identity into the show and go, actually it’s super-cool to be different.” Watch the video. Original generation time 1.1871 seconds. Cache Loaded in: 0.0010 seconds.